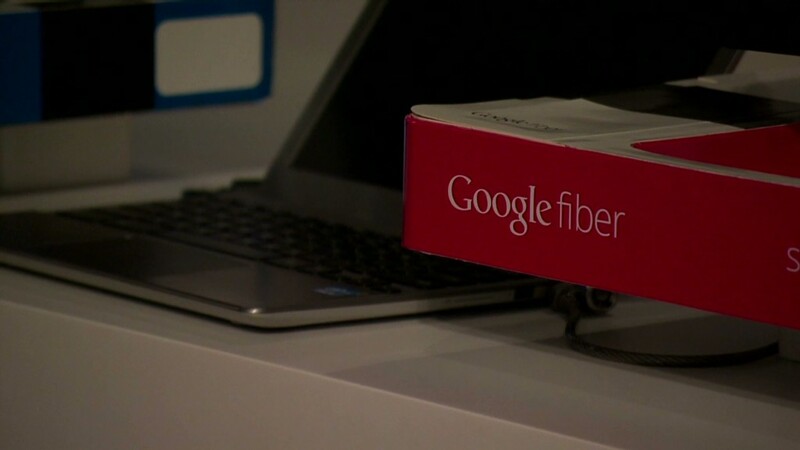 Austin is the third city to get access to Google Fiber. The next city to get Google's ultra-high-speed Fiber network is Austin, Texas. 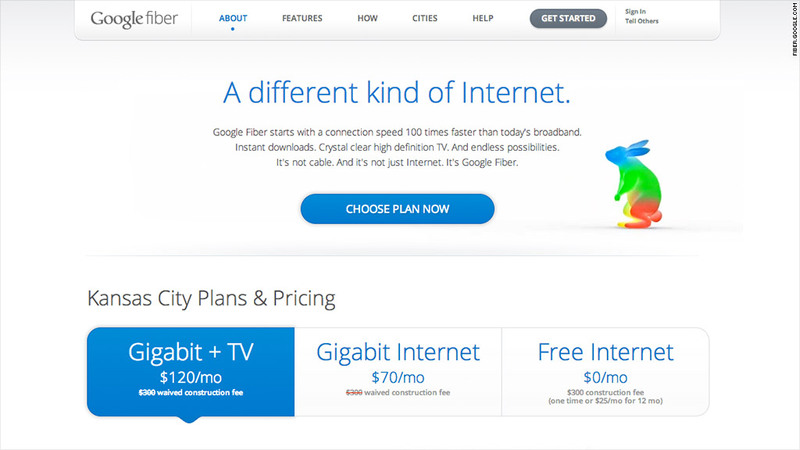 Google Fiber offers Internet speeds of up to 1 gigabit per second, which Google says is 100 times faster than the average American Internet user's service. Google (GOOG) also offers a Fiber TV service that lets customers watch all shows in HD, record up to eight shows at once and store up to 500 hours of HD video in the cloud. Customers can watch across several devices, including cell phones and PCs. Austin is the third city to get access to Fiber, after Google launched the service last summer in select neighborhoods in Kansas City, Kan., and Kansas City, Mo. The former was chosen in 2011, after more than 1,100 cities applied to get Fiber first. "It's a resource that could help make our city even more innovative and make our city even stronger," said Austin Mayor Lee Leffingwell, at a press conference. Google will begin connecting Austin homes by mid-2014, the company said in a blog post. Google called the city "a mecca for creativity and entrepreneurialism." Milo Medin, Google's Fiber chief, spoke at the announcement in Austin, saying city officials "worked tirelessly to convince us to come to Austin." But Google will be competing for those creative Austin minds: Shortly after Google's conference, AT&T announced it will also offer 1 gigabit connections in Austin. It's part of AT&T's "Project VIP," a bid to expand broadband access. Mayor Leffingwell noted that Austin did not offer any financial incentives to Google or AT&T. "Competition is a good thing," Leffingwell said. "That can only make things better and cheaper for consumers." It's unclear exactly how cheap, however. AT&T did not announce pricing, and Google's Medin said his company hasn't "settled on pricing for Austin." In Kansas City, the Fiber Internet and TV package costs $120 a month with a two-year contract, and those customers can control multiple televisions using the included Google Nexus 7 tablet. Google also offers an Internet-only option for $70 a month and a free Internet service at "today's average speeds." The search giant is also providing the service for free to local schools, community centers, government buildings and libraries. The speedy service is an exciting option for customers, but building out a new network costs a lot of money, from laying down the network infrastructure to actually connecting individual homes. Analysts aren't convinced it's a smart business move for Google. In a note to clients on Monday, Bernstein Research analyst Carlos Kirjner poured cold water on hopes of a nationwide Fiber rollout. "We remain skeptical that Google will find a scalable and economically feasible model to extend its build out to a large portion of the U.S.," Kirjner wrote, citing "substantial" costs. He's also concerned about regulatory issues and stiff competition from existing providers like Verizon (VZ), Comcast (CMCSA) and AT&T (T). Kirjner estimates the two Kansas City rollouts will surpass 149,000 homes, and he says it will cost about $84 million just to lay the infrastructure for those customers. He estimates it will cost Google $464 to connect each Internet-only customer, and $794 for a TV and Internet home. Connection costs could be similar or even a bit lower in Austin, whose population density is higher than Kansas City. Fiber-optic installation often involves ripping up a customer's lawn. Verizon is not planning to expand its FiOS fiber-optic network, and as part of Project VIP, AT&T recently pledged to bring fiber to its neighborhood networking nodes -- but not to homes. Still, Google has made it clear it plans to expand the service. According to the Fiber Cities website, Google will roll out Fiber to handful of cities around the initial launch site: Missouri's Kansas City North and South, and Kansas' Westwood, Westwood Hills and Mission Woods. The timeline is unclear, but all five cities are listed as "coming next."